Picketers blocked garbage trucks from leaving a depot in Paradise Monday morning, after town employees were locked out of work following a breakdown in contract talks. Picketers blocked garbage trucks from leaving a depot in Paradise Monday morning after town employees were locked out of work following a breakdown in contract talks. After months of negotiations, workers represented by the Newfoundland and Labrador Association of Public and Private Employees (NAPE), voted in favour of a strike on Oct. 15, but had not actually taken action to walk off the job. Then, as of 6 a.m. Monday, the town locked the workers out. 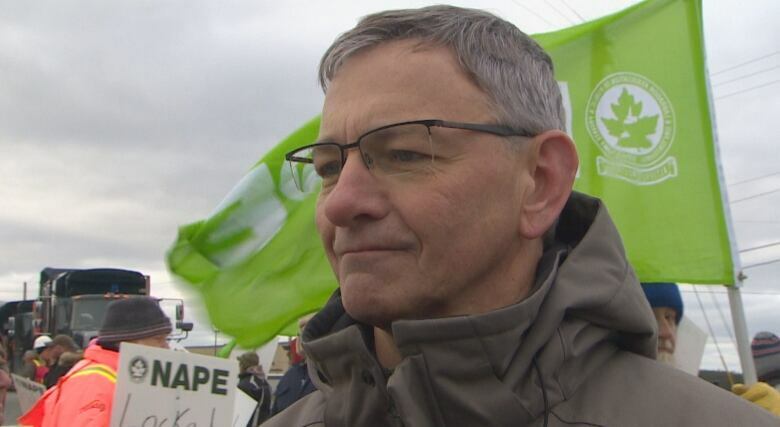 "This is an employer action," NAPE President Jerry Earle told CBC News. "We often hear unions being criticized for taking job action. Well this is an employer that took a job action to lock 120 people out, providing invaluable services to the residents of Paradise." Paradise Deputy Mayor Elizabeth Laurie said the town was being proactive by locking out the members on Monday, instead of risking waiting for members to call a strike just as the winter months and snow clearing operations were starting. "We made the decision that it would be in the best interest of our residents to try to resolve this matter as quickly as possible, so we made the decision to proceed with the lockout," Laurie said following the start of the lockout. The town says the union was offered a three-year contract that included a 10 per cent wage increase: five per cent retroactive to Jan. 1, three per cent in 2018 and two per cent in 2019, as well as an increase in the per-diem rate for travel. The workers' contract expired Dec. 31, 2016. "We've been very, very receptive to the bargaining process and we just feel that they're looking for another five per cent. We just can't do that at this time," Laurie said. The Town of Paradise said during the lockout, essential services including water testing, garbage collection and snow clearing will continue, but recycling collection would be suspended. The town hall will stay open to support essential services, but recreational facilities were closed effective 11:30 p.m. Sunday, including the Double Ice Complex, the Paradise Youth and Community Centre, the Dianne Whalen Memorial Soccer Complex, Milton Road Softball Complex and Peter Barry Duff Memorial Park. The town's after-school program, fitness classes, and user rentals — including birthday parties — are suspended, as are regular inspections of playgrounds and trails. Council meetings will move to a monthly schedule. "Our staff does an incredible job with snow clearing in the town," she said. "The caliber of service that they provide is second to none and we feel that we could not possibly keep up that standard of service so we are looking out for the best interest of our residents." Meanwhile, Earle said his members have concerns over who will be replacing locked out workers. Those on the picket line stopped a fleet of garbage trucks from leaving the town depot Monday morning, which were being driven by managers. 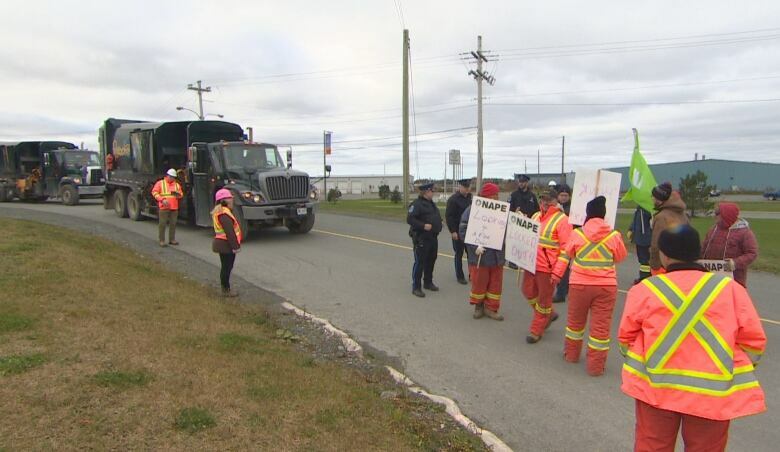 "They are going to stand up for their rights, and those trucks will sit there as long as these women and men determine to keep them there," Earle told CBC News from the picket line. "Some of these people who are going to operate these trucks over the next little while, they got their licence in the last seven days to operate a piece of equipment that's the size of a Metro bus." Laurie said the Town of Paradise is hopeful that a deal will be reached before the snow comes, and that town negotiators are open to returning to the table at any time. Earle agrees, and said he and the hired negotiator are on standby for any request to open up talks. He said as with any dispute, the longer it goes on the harder it can be to come to an agreement. He said he's reluctant to talk to the media about the specifics of the negotiations, and he wants to keep good faith with the town in the hopes that it can be resolved in hours or days — not weeks. "The moment you start airing your dirty laundry in public both sides will start raising issues and putting yourself further apart," he said. "We were a significant distance apart months ago and we've gotten closer. I think if we start [commenting publicly] we're going to start to cause a division where people are going to get really entrenched in their position."